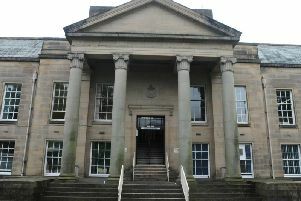 A Nelson man who admitted drink driving in Burnley has been fined 120, with 85 costs, a 30 victim surcharge and he was also was banned for 20 months. Christian Schofield was caught after police saw him hit the kerb and were concerned about his concentration. He blew 84 microgrammes of alcohol in 100 millilitres of breath at the police station. The reading was higher than at the roadside, indicating the alcoholic drink had been recent. The legal limit is 35, Burnley magistrates were told. The 48-year-old, who was not represented by a solicitor, said he had made a " massive, massive error of judgement," which had forced him to hand in his notice at work the day after. Mrs Alex Mann, prosecuting, said the defendant was seen at 12.30am in Burnley town centre. She told the hearing: There were lots of police around. It was quite busy. They saw the defendant's vehicle on Hammerton Street and Queen's Lancashire Way. "It seemed to very slightly bump the kerb. Mrs Mann said Schofield complied with officers and added:" The (breath -test) amount at the police station was more than at the roadside. The amount was rising." Schofield had no previous convictions. The defendant told the Bench he expressed 'complete remorse' for what he did and it was completely against what he would normally do. Schofield said he had been to a private party and intended to get a taxi home. He returned to his car to get his jacket and found he had a puncture on his front left tyre. He continued: " I made a stupid, stupid, decision to drive the car round to Kwik Fit to park it there for the morning." The defendant went on: " I would never have contemplated driving home. It was a matter of a minute in the car. I don't know why I did it. "I still don't know why I did it. "The day after, I handed in my notice at work. I worked in Stockport. I have since been seeking employment more locally. "I'm just really, really sorry for what I did." The defendant, of Thursby Road, Nelson, admitted driving with excess alcohol on Active Way, Burnley, on Saturday, March 23rd. He was fined £120, with £85 costs and a £30 victim surcharge and was banned for 20 months.